How can the Toronto Library System be so backward? 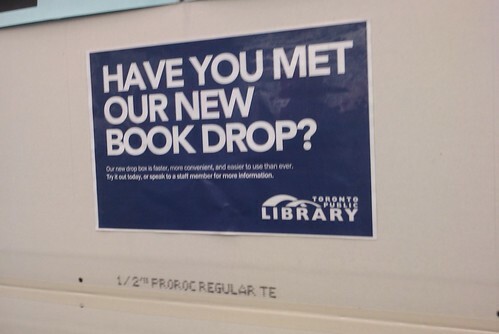 And in front of the returns desk was a box that said “Book Drop”…which nobody used. In fact, as I waited in the interminable checkout line, several people walked up, looked at the drop box for a few seconds, and then got in line to return their books. Insane. In Mississauga, you either put stuff in the drop box or just left it in a stack at the returns desk. There was no line. Today, I learned another thing that I just can’t wrap my head around. You have to return books to the same library you checked them out at (I’m not sure what the rule is for inter-library orders). That is just wrong. I will entertain the idea that there is some sane logistical reason behind it (they service a larger city with worse traffic) but together with the whole drop box thing, I can’t help but conclude that the system is just backwards. Here’s a few things that I think the ideal city library system would have. First, drop boxes. Second, the ability to return a book to any library you want. Third, the library you return it to does not send it back to the original library. There is no sense in having a book have a ‘home’ in a computerized city wide library system. Instead, the system should allocate books so that they are geographically spread out and pay attention to where consumer demand is. This would also encourage a naturally efficient distribution of niche books. If there is a particular demand for certain books or authors in one area (perhaps there might be more demand for Italian authors in a heavily Italian neighbourhood and more demand for sailing books down by the lake) then the book will tend to stay in the area where it is wanted. When a book is checked in, the computer could decide dynamically where to send it. And if I’m right about geographic patterns of demand, it will most likely stay at the library where it was dropped off. This will mean fewer trucks running around carrying books and I’ll have single handedly saved the environment. Go me. Fourth, the ideal library system would have the book I ordered two weeks ago and that was released in stores 6 weeks ago.